Call for Group rates for 15 or more people. Whether it's an appreciation party, a summer celebration, or an event to mark a grand anniversary for your company, YORK'S WILD KINGDOM can help you create a time to remember. With our various option packages, you can choose the best fit for your budget, style and time limitations. Everyone will enjoy the day as their imagination leads them through the multitude of sights and entertainment at the zoo and park. When you have selected the date for your outing, you will be sent a contract to be signed and returned within two weeks to ensure that your reservation date will be held. A $100.00 (one hundred dollar) deposit is required to confirm your reservation. If you choose to pre-pay 50% of your total estimated outing costs and we receive it before June 1st with a signed contract, YORK'S WILD KINGDOM will credit you $1.00 off each admission pass on your final bill. THAT'S AN ADDED SAVINGS OF OVER 10%! If you have a catered meal on the day of your outing (for parties of 100 or more), a guarantee for the number of people attending needs to be in our office within ten days of the outing date. If we are not catering your picnic there is a $250.00 fee to reserve the use of the picnic grounds. The $100.00 deposit is non-refundable unless the outing is canceled in writing and is received in our office within 60 (sixty) days of the scheduled event. Once your deposit is received, the appropriate number of passes will be mailed to you. These passes are necessary for admission to the park on the day of your outing. You will exchange your "Reservation Pass" at the picnic entrance and at that time your hand will be stamped and an "All Day Pass" will be issued to each member of your group. Your official company stamp must be applied on each of the "Reservation Passes" that we send you to be valid for admission. (This is for your protection.) We recommend that this be done prior to your arrival to avoid any unnecessary confusion. Any pass without an official stamp will not be accepted. Passes are good only on the day of the outing unless other arrangements have been made. Any group member who arrives without a valid stamped pass must go to the YORK'S WILD KINGDOM Administrative Office. All children 3 years old or less are admitted FREE to rides, Zoo admission, and food (if your outing is catered). all children must be accompanied with an adult. The total head count for food is determined by the number of passes we collect on the day of the outing. The final bill for the food is based on the contract guarantee or the gate count, whichever is higher. The ZOO and RIDE portion of the bill is based solely on the gate count. Each member of your group who is participating in the catered meal must have their "All Day Passes" with them and show the stamp on their hand at the time the food is served. This prevents other park guests from attending your company picnic. YORK'S WILD KINGDOM will try to meet any other requests you may have, i.e., volleyball nets, sound system, etc. 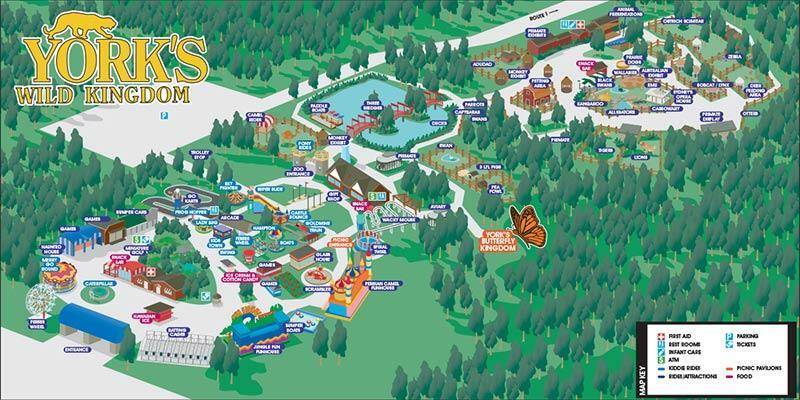 After your outing, YORK'S WILD KINGDOM will send a bill for the number of "Reservation Passes" collected at the picnic entrance on your outing date. Any bill not paid within 30 days of the billing date will incur a 2% monthly finance charge. Any bill paid in full within 15 days of the billing date will receive an additional 2% credit toward next year's company outing! The hours of operation for YORK'S WILD KINGDOM can be customized to better accommodate you on the day of your outing. Inquire when confirming your reservation. We are here to make you happy and give you a pleasant and memorable experience. If you have any ideas on how we could personally customize your day at the Kingdom please feel free to ask. YORK'S WILD KINGDOM is now offering fantastic savings for large corporations and small businesses! For more information on discount presale tickets call 1-800-456-4911. Chicken and Sirloin Tip Combo. $30.00 p.p. Barbeque Mixed Grill $28.00 p.p. Prices depend upon the number of guests and which options are chosen.